Orly Enchanted Forest. This was my first green polish. I wasn't too sure if I would like it until I applied it and I was hooked. 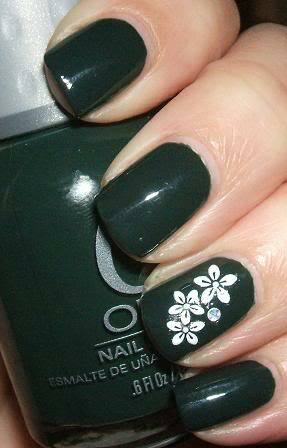 This slightly murky, deep green creme applied easily and was opaque in two coats. I added a nail decal just for fun. I like this, too. It is dark, but not vampy or black.